weekly weigh in for toller puppies. Puppies will be listed 1-6 in conjuction with the weight chart. A very hart warming response. A tear jerker from 2 very kind people. Thank you for your kind words, both Malin and I were really touched. Thank you too for letting us come and visit and welcome us into your home. It was about this time last year that Malin and I were spending many hours in front of the computer or on the phone contacting breeders of the NSDTR. Those hours were not only long but also very frustrating for us. Trying to find reputable breeder, whom we could feel confident about was not so easy, especially when Scarlett is our first dog and the kind of dog I have been dreaming about for the last 25 years. Having put a lot of time researching, we were lucky enough to have found you two. From the moment of our first meeting at the pink house I felt welcomed, and relaxed by your attitudes, and comforted by your apparent knowledge and enthusiasm. From that day to this you have been friendly, reliable, knowledgeable and most of all, on the end of a phone. You have given us some great advice on behaviour, health, training and many other things. And in my case, you have been patient. And I strongly advise anyone to listen to what you have to say. 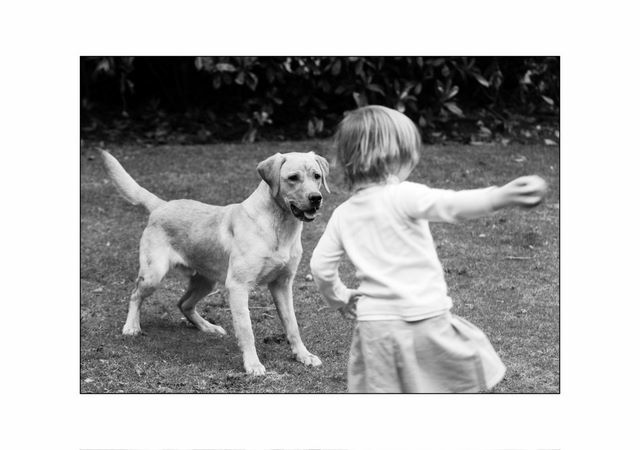 It is not just down to Malin and I, that Scarlett is the great little dog she is today. It is down to you and your knowledge, encouragement, sound advice and obvious love for the dogs you breed and sell on. And it is because of all this that we say thank you very much! Toller litter a week old already. Today we had a great email from Henri and Cecile Gentis, a great couple from Holland who took on Jack a part trained gun-dog. Although he was a part trained gundog they wanted him first and foremost as a family companion for there 2 children.Jack settled in very quickly and became a big part of family life over night. He and his new family are now back in Holland, but will be retuning to visit us in August. We wish them all the best and look forward to their visit in the autumn. Today we had a visit from Scarlett with her new mum and dad Barry and Malin. Scarlett was daughter to Amber and Rudy. Scarlett is coming up 5 months old and training is coming on strong, if anything she’s too calm. Barry has high hopes for her in couple of areas which include gundog training and search and rescue. Scarlett couldn’t of wished for a better couple to become her new owner’s, they are absolutely 100% devoted to Scarlett hoping they can help her reach her full potential. 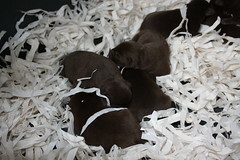 Clickthe photo to see more of this chocolate labrador litter. 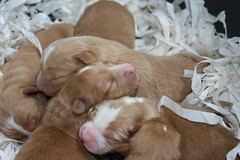 Toller puppies only 4 days old.